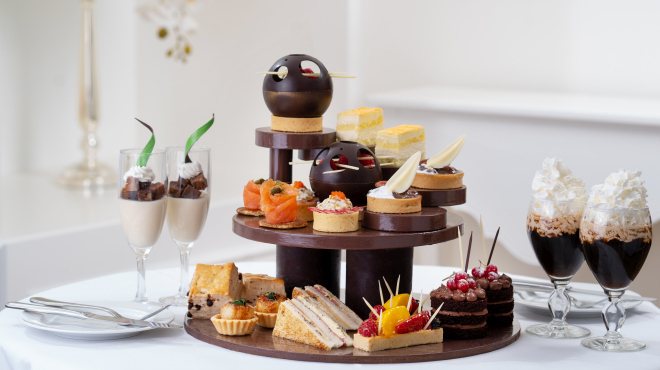 Brighten up your afternoon with this concoction of chocolate and Scotch whisky afternoon tea set creation meticulously handcrafted by the culinary team at Lobby Lounge. Complementing each other, delicacies made from this classic combination are rich and smooth, with a creamy taste. Enjoy multiple layers of flavours from an array of savoury and sweet delicacies by starting with freshly baked chocolate scones, and savoury items such as Mango and Crabmeat Tart with Whisky Jelly, Seared Canadian Scallop Tart with Whisky Sauce and Smoked Salmon on Herbs Hot Cake, followed by sweet treats including the eye-catching Milk Chocolate and Hazelnut Tart, Chocolate Whisky Pecan Pie, Whisky Chocolate Naked Cake and White Chocolate and Whisky Panna Cotta with Brownies in Glass. Round off the gastronomic journey with a choice of Irish Coffee, Tiramisu Liqueur Hot Chocolate as well as non-alcoholic Iced Coffee with Chocolate Ice Cream. Some of the food and drink items contain alcohol, please consult our servers for details. Subject to 10% service charge based on original prices. Reservation at least 24 hours in advance is required. Only 10 sets are available each day.